Nessa Bruce waits for her husband to come through the double doors. She’d waited for his return home from Afghanistan for what felt like forever, and now the moment was finally here. But Jake Bruce hasn’t come home, and it looks like he never will. Nessa’s life, and that of her daughter Poppy is turned upside down in an instant. What has happened to this man at the centre of their world? 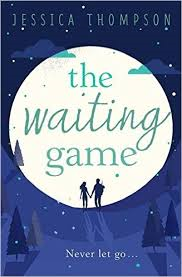 They hold onto the hope that he is still out there somewhere, but as time passes by, Nessa is forced to look at her life, at the decisions she has made and the secrets she has kept. Where is the man she loves and will he ever return. This book had me crying and routing for the characters like never before. Nessa the main character is beautiful and strong with a heart of gold. She always puts everyone first and has been through so much that I was nearly pleading for her to have a break. Jake just seems charming and perfect but I couldn’t help but be a little angry with him for leaving Nessa and Poppy behind. His parents are simply lovely and the book touches on mental health issues as Jake’s father battles Alzheimer’s. Will is charming and the sort of person that you would be lucky to have in your life and I feel Nessa and Poppy were lucky to have him in their life. I loved the will they, wont they situation throughout the book. This novel written by the lovely Jessica Thompson is not to be missed. It covers so much in its 300 odd pages like domestic abuse, depression and suicide, love, loss and family dynamics. It is heartfelt and honest and it is so emotionally charged that I literally couldn’t leave it down. Without a doubt the easiest 5 stars ever given to a book. Thank very much to Rebecca Mundy at Hodder and Stoughton and Book Bridgr for my advanced reading copy of this book.